The book Why Nations Fail by Daron Acemoglu and James A. Robinson comes with book-jacket praise from the usual suspects: Steven Levitt of Freakonomics fame, Jared Diamond of Collapse fame, Nobel Prize “laureate” George Akerlof, and Niall Ferguson, champion of imperialism. Thomas Freidman dashed off a quick review in his New York Times column for April 1, 2012. Freidman, the giddy fan of globalization, was ecstatic, although he admitted that he was “reading” the book, but not that he had “read” it. Freidman points out one of the authors’ main points: “Inclusive economic institutions that enforce property rights, create a level playing field, and encourage investments in new technologies and skills are more conducive to economic growth than extractive institutions that are structured to extract resources from the many by the few.” And this is perhaps their main point, albeit one which they share with most neoliberal development economists. Acemoglu and Robinson are professors at MIT and Harvard Universities; Acemoglu is a winner of the John Bates Clark Medal in the Economics department at MIT and Robinson an area specialist in the department of Government (Political Science)at Harvard. The book seems to be aimed at a wider audience than academia, however.While the authors mine an enormous literature on development to populate their book with dozens of interesting stories of developmental failure and success, at the end of the day, their book devolves into the something similar to most of the neo-liberal thinking of which we see so much from the “science” of economics. Diamond, who is quoted on the book jacket as saying “Like me, you may succumb to reading it in one go, and then you may come back to it again and again” is more critical in a review in the New York Review of Books (7 June 2012). There he points out that after presenting a map of Africa that clearly shows the tropical countries of the interior of the continent at the lowest end of the income scale they insist that geographic factors are “Theories That Don’t Work” compared to their preferred “institutional” explanation. Diamond’s reaction: “While institutions are undoubtedly part of the explanation, they leave much unexplained: some of those richer temperate countries are notorious for their histories of bad institutions (think of Algeria, Argentina, Egypt, and Libya), while some of the tropical countries (e.g., Costa Rica and Tanzania) have had relatively more honest governments. What are the economic disadvantages of a tropical location?” He concludes, “In their narrow focus on inclusive institutions, however, the authors ignore or dismiss other factors. I mentioned earlier the effects of an area’s being landlocked or of environmental damage, factors that they don’t discuss. Even within the focus on institutions, the concentration specifically on inclusive institutions causes the authors to give inadequate accounts of the ways that natural resources can be a curse.” After describing Acemoglu and Robinson’s botched job in their explanation of the rise of agriculture “to assert, in the complete absence of evidence, that . . . hunter/gatherers had become sedentary because, for unknown reasons, they happened to develop innovative institutions through a hypothesized political revolution” he concludes that “Acemoglu and Robinson do themselves a disservice by misstating these findings.”The book has a few points to recommend it in this reviewer’s mind: 1) Its insistence on uncertainty in the course of human affairs, 2) Its appreciation for the importance of centralized political structure on economic success, 3) Its recognition of the wasted resources that come with gross inequality. But it has glaring blind spots that should cause a critical reader pause.In the first chapter the authors quote from Fra Bartolome de Las Casas’s book, A Short Account of the Destruction of the Indies. Las Casas is presented by the authors as a hero, who defended the rights of the indigenous people enslaved in the New World by the conquistadores. They seem positively unaware, however, of the irony that motivated Jorge Luis Borges to mention Las Casas in the very first chapter of HIS book, A Universal History of Infamy. For Las Casas’s answer to the enslavement of the indigenous people of the New World was to import Africans to work in the Antillean gold mines. Thus Borges sees Las Casas not just as the savior of the indigenas of the New World (in which effort he was unsuccessful in any case) but as the father of “W.C. Handy’s blues; . . . the mythological dimensions of Abraham Lincoln; the five hundred thousand dead of the Civil War and its three hundred millions spent in military pensions; the entrance of the word “to lynch” into the thirteenth edition of the Spanish Academy . .” etc. This kind of irony is well over the heads of our authors.They take the “failure” of the Mayan civilization to be the result of their favorite themes of “creation of extractive political institutions” and lack of “creative destruction.” They recognize that “the coalescence of these institutions created the basis for an impressive economic expansion” but see its collapse in the ninth century AD to be the result of the overthrow of the political system that had produced this expansion. They recognize that “existing archeological evidence does not allow us to reach a definitive conclusion about why the k’ubul ajaw and elites surrounding him were overthrown” but they take this collapse as evidence nonetheless for their theory that “extractive institutions” were the cause of that collapse. And concerning their diagnosis of “collapse”, should a Mayan society that apparently thrived for close to one thousand years be considered a failure? There is no discussion of the possibility that laterite formation in tropical soils had anything to do with this “collapse.” The story of the Mayans just becomes another example of their pet theory.I have mentioned “creative destruction”. Although there is only one direct mention of the “great economist Joseph Schumpeter” in the book, there are references aplenty to Schumpeter’s most memorable phrase. Creative destruction was explained by Schumpeter as follows: “The opening up of new markets, foreign or domestic, and the organizational development from the craft shop and factory to such concerns as U.S. Steel illustrate the same process of industrial mutation – if I may use that biological term – that incessantly revolutionizes the economic structure from within, incessantly destroying the old one, incessantly creating the new one. This process of Creative Destruction is the essential fact about capitalism.” (Capitalism, Socialism, and Democracy, page 83.) Schumpeter was convinced that the entrepreneur is the driving force for development in a capitalistic society. Keynes was not so sure, remarking “we are damned if we know” why capitalists invest.Acemoglu and Robinson seem to take as gospel that creative destruction is necessary for societal advance and always works toward the public good. Someone like Polanyi would no doubt not agree. Schumpeter’s young Harvard colleague Paul Sweezy certainly did not agree when he participated with Schumpeter in their famous debate at the Harvard Graduate Student’s Economics Club in the winter of 1946-47 (See “on the laws of capitalism, Insights from the Sweezy-Schumpeter Debate” in Monthly Review, May, 2011.) Sweezy’s notes for the debate say that “There is no reason to deny Schumpeter’s entrepreneurial type, but its significance is quite differently evaluated. For him the entrepreneur occupies the center of the stage; the accumulation process is derivative. For me the accumulation process is primary; the entrepreneur falls in with it and plays a part in it.” Sweezy was, of course, one of the most prominent American Marxist economists of the twentieth century. For him the historical process of evolution of society was crucial, as it was for Marx. And Schumpeter, even as an Austrian economist, had a profound appreciation for this. It is not fair to Acemoglu and Robinson to say that they are oblivious to history; their book is full of historical anecdotes. But this reader gets the sense that for them if a society would just get with the program and encourage capitalists, everything would come out all right.They rail against the monopolies and resistance to enclosure by the Tudor and Stuart kings in England. This is a typical response of the neo-liberal. The problem is not market economies, they say, but those that interfere with the “free” motion of these economies in society. They attribute the rise of the Industrial Revolution in England to an overcoming of the absolutism of the Tudors and Stuarts by the rise of “inclusive institutions” embodied in the Glorious Revolution by the rise of Parliament. But the destruction part of the rise of the entrepreneurial class gets little appreciation. For that we have to read Polanyi and Marx. And they are oblivious to the fact that without Tudor protectionism, the wool-spinning industry in England may never have gotten of the ground. To learn about this we would have to read the Marxist historians or Ha-Joon Chang's Bad Samaritans.This book contains almost no reference to socialist or even non-free trade capitalist critique of the development policies which the authors prefer. This, of course, is typical of the environment of American academic departments of economics and political science, where our authors reside. In spite of their re-telling of many stories about the corruption and distortion imposed upon the people of the South by European imperialism in the nineteenth century, there is no mention of Lenin’s Imperialism, Highest Form of Capitalism. No mention of Polanyi. The only significant mention of Marx is in a passage where they say “Lenin and his Communist Party were inspired by Marx, but the practice could not have been more different than the theory. The Bolshevik Revolution of 1917 was a bloody affair, and there was no humane aspect to it.” In fact, the Russian Revolution was remarkably bloodless, since the army went wholly over to the Revolution very early in the process. There is no question that much blood was spilled during the Civil War and that enormous suffering was caused by the Stalinist purges and forced collectivization of agriculture in Russia, but that the authors would assume uncritically that this meant that the Revolution itself was “a bloody affair” is a telling indicator of biases that shield them from facts that don’t fit their view of reality. In a book that is so filled with facts, this ignorance seems systematic; as if they were searching out only the facts that fit their theory. The authors make an off-hand reference to current day Iraq (on page 444) with amazing lack of empathy for the impact of the “shock and awe” imposed on that country by the Bush/Cheney/Rumsfeld regime and the UN Sanctions that preceded it. They use Iraq’s recent history to argue against the “theory of modernization” that they say “maintains that all societies, as they grow, are headed toward a more modern, developed, and civilized existence, and in particular toward democracy.” They mention the “disastrous economic performance under Saddam Hussein’s regime” without mentioning the years of pain imposed by continuing NATO-enforced sanctions and bombardment. For a more realistic estimate of that impact the reader is directed to Iraq Under Siege, The Deadly Impact of Sanctions and War, published in 2000, three years before “shock and awe.” There the reader will find another reason behind that “disastrous economic performance” of the previous decade. Anthony Arnove in the introduction to Iraq under Siege quotes from a Wall Street Journal article in 1999 citing unnamed US officials saying, “After eight years of enforcing a ‘no-fly zone’ in northern [and sourthern] Iraq, few military targets remain. . . . We are down to the last outhouse.” Acemoglu and Robinson say that hopes for “pluralism” were “dashed as chaos and civil war descended upon Iraqi society.” This implies that the “chaos and civil war” were the result of some internal dynamic in Iraq without considering that what had descended onto Iraqi society was not just the “extractive institutions” of Saddam Hussein but also the wrath of the American Empire, imposed over a decade of economic sanctions and bombardment since the end of the first Iraq war, “Desert Storm”. They fail to mention the possibility that 6,000 sorties and 1,800 bombs as part of the “longest sustained US air operation since the Vietnam War” had anything to do with the dissolution of Iraqi society that followed the second US land invasion by Bush, the younger. Iraq had long since been “bombed back to the stone age” to quote an earlier American general talking about that earlier war. Acemoglu and Robinson make no mention of this.One of the interesting facts that the authors dredge up from the large anthropological and historical literature upon which they report is a story from the history of Dutch colonialism in the East Indies. They tell the story of the Banda Islands which had established trading relations with English, Portuguese, Indian, and Chinese merchants for mace and nutmeg, which were indigenous to their islands. In 1621 the Dutch governor of Batavia (now Jakarta in Indonesia) Jan Pieterszoon Coen “sailed to Banda with a fleet and proceeded to massacre almost the entire population of the islands, probably about fifteen thousand people.” He set up a plantation system in place of the thriving economic activity of the local Banda people and “divided the islands into sixty-eight plantations, awarded to sixty-eight Dutchmen, mostly former and current employees of the Dutch East India Company.” They use this to support their major thesis, that “European expansion . . . sowed the seeds of underdevelopment in many diverse corners of the world by imposing, or further strengthening existing, extractive institutions.” But their emphasis is on the “extractive institutions” and not on the fact that European imperialism imposed this reality by genocidal force of arms. This is a very strange emphasis to place on these facts.Diamond’s critique in his NYRB article provides a good summary of this book. There he points to “the authors’ resort to assertion unsupported or contradicted by facts.” This book presents what is really a banal conclusion: that authoritarian institutions that impose the will of a small group of elites onto a population is the primary cause of “underdevelopment”. This is not a new theory. It is a re-statement of Aristotle’s Politics. The real questions are why these authoritarian institutions succeed in taking over power in so many societies and how societies with apparently “inclusive” institutions like those in current day United States have evolved into such unequal societies. This book leaves us no closer to an answer to these questions.The real problem that I have with this book is that it uncritically takes for granted the underlying assumptions from the neoclassical economist’s tool box. They point out the obvious: “Europeans themselves stamped out the possibility of economic growth in many parts of the world that they conquered; . . . the lands where Industrial Revolution originally did not spread remain relatively poor; . . . . the Industrial Revolution and other new technologies are unlikely to spread to places around the world today where a minimum degree of centralization of the state hasn’t been achieved.” These conclusions are delivered with a tone of great solemnity, but no one but the most dogmatic libertarians or European chauvinists would seriously disagree. The real question is how to change this. Their prescription of more “inclusion” the like of which we have in the United States may satisfy some, but it does not satisfy this reviewer. This economic history is, as far as it goes, excellent. The main thesis is ultra simple: nations must develop inclusive economic and political institutions if they are to achieve prosperity. Such political institutions include fair and free elections, an independent judiciary, uncorrupt legislative and executive branches etc etc. Inclusive economic institutions include financial controls such as (in the U.S.) the Fed, the SEC, trust breaking litigation, and so forth. The authors say all of these things are mutually reinforcing. In the U.S., for instance, all three main governmental institutions at the federal level hold each other in check. This is also more or less true in Canada, Western Europe, Japan, Australia, New Zealand, and Botswana. Yes, that Botswana. The stories of Botswana -- and the rest of post-colonial Africa -- are ones I have not come across elsewhere and for which I am especially grateful.Nations with inclusive economic and political institutions allow something called "creative destruction." This is what happens when new technologies appear and cause a redistribution of wealth. Perhaps the most recent example of creative destruction has been the impact of computers and the internet. So many industries have been upset by these new technologies: publishing, the music industry, retail stores, manufacturing, etc etc. Nations which do not have inclusive economic and political institutions are called "extractive." An extractive nation is one in which an elite prospers from the misfortune of the rest of the population. One example of this is the post-colonial African nation of Sierra Leone. When the British left Sierra Leone, and it was thought that the extractive mechanisms they had put in place would be abolished, just the opposite happened. Local strong men came along and upped the ante. This had the effect of disincentivizing entrepreneurs. After all, why work hard if 90% of one's output will be seized by the junta? Moreover, such extractive nations will not permit creative destruction because it threatens to undermine the power of the governing elite. So the extractive states tend to be backward because they shun new technologies. Though examples from antiquity are adduced -- Rome, Mayan civilization, for instance, both extractive -- the authors are mostly concerned with what happened starting with the Industrial Revolution on. They show how the English Civil War and subsequent Glorious Revolution set the stage for the growth of inclusive political and economic institutions in England and how these became mutually reinforcing over time. The book is compelling. I hope people living in these extractive nations will get a translation because it is so eye-opening. But that's unlikely, isnt it? Since a major feature of extractive nations is suppression of the media, which is transparency. This is a view of history, on the other hand, that does not question its foundations. It's a great cheering section for capitalism generally. But there's a huge problem with this economic-growth-at-all-costs mentality. It may have been fine for a century or so but now it's no longer tenable. In fact, it's killing us: climate change, loss of biodiversity, global deforestation; our oceans are covered, by one recent estimate, with 480 billion cubic tons of plastic. GDP is the wrong measure of our "progress" now. We need new sustainable economic models. So the book, while being a captivating history of how capitalism has worked historically, offers no solutions for how it might change. New models are badly needed. If, that is, we haven't already passed the ecological tipping point. This could be written in one chapter or a long magazine piece. Has an interesting theory, but it just goes on for too long and not worth spending the time. Their main thesis is very interesting - that there is a strong link between political/social institutions and the economic success or failure of a nation.Compare Botswana, which has achieved remarkable growth despite the AIDS epidemic, and Zimbabwe. Compare South Korea, which was poor, and is now a regional power, to North Korea, where the huddled skeletal masses pluck corn kernels from feces to survive while the Kim clan gorged on cognac.The main reason states are successful, say Acemoglu and Robinson, is that they have a strong supportive centralized set of institutions, which they call 'inclusive'. These include property safety, a free market, technological growth, and so forth.Nations Fail because of 'extractive' institutions - those which prevent the products of economic work from directly benefiting the economy as a whole, or unequally distributing it. Colonial regimes serve as an example, as well as aristocratic, dictatorial, or otherwise authoritarian regimes. A few benefit, but the society as a whole suffers. You can send as much aid as you like, but it will all be siphoned up or lost.They also refer to Schumpeter's phrase 'creative destruction'. This is when a new economic or technological phenomenon threatens to unseat or unravel an established economic order in order to create a new one. If those who stand to lose from this new order are also in positions of influence and power in society, then naturally they will try to prevent it. Consider the reluctance of the Habsburgs or the Russians to allow factory building or railroads, or the Ottomans to allow printed books entirely. After these interesting concepts, the rest of the book is devoted to examples, from Ancient Rome to Axum to Uzbekistan. The reading list in back is interesting enough, and I'd like to investigate this in much further detail. I'd have liked a discussion of the Scandinavian states (welfare, engineering, oil), Canada (former colony, resources, political engineering), Singapore (political engineering, no resources to speak of, formerly colonial), and other cases of where prosperity had sprung up from nothing, in contrast to the series of catastrophes and famines and horror that we have seen already. And what about India, with its own long and varied history? The authors have reasonably cast doubt on China, with its state capitalism. And those even further to the left might make a case for a present oligarchical-corporatist structure as an extractive institution. No doubt the authors will address these concerns in a new writing/edition. A very thought provoking book on the causes of poverty and wealth among nations. Such an insightful and shocking book! The examples are very well-explained, and I truly enjoyed thinking and discussing the points raised in this book. Only if more people would read this book and understand that it is not for the lack of aid to poor countries, but the very political and economical structure of the country that makes it poor. The whole inclusive and extractive political-economical standpoint is very interesting. The only nitpick I would comment on: the book suffers from excessive repetition. Only if the writers of this book would take some lessons from Jonathan Haidt on how to structure a (non-fiction) book properly. This is an excellent book about the reasons why some nations are prosperous, while others are steeped in poverty. The authors contend that some nations have "inclusive" economic and political policies. These policies give a political voice to a large segment of the population, rather than only to a small elite. As a result, a set of checks and balances tends toward a positive feedback, sometimes called a "virtuous cycle". This virtuous cycle helps to accelerate the tendencies toward inclusiveness, and to suppress occasional lapses toward power-grabbing.The other side of the coin are nations with "extractive" economic and political policies. A single person, or a small elite, finds it in their personal interests to grab power and extract as many of the nation's resources for their personal gain. They reject technological innovation, and try their best to maintain the status quo. These nations may temporarily improve their economical conditions, but in the long run their improvements cannot be sustained. Interestingly, the authors claim that China, despite economic improvements in recent decades, is going to be a short-lived phenomenon. At its roots, the political system is still extractive, because it does not allow dissension, does not protect private property, and does not extend the rule of law to everyone.The authors go into considerable detail, explaining why Western Europe, especially Great Britain, became more economically successful than Eastern Europe. They extend their understanding to North vs. South America. They describe the histories of many other countries as well, to understand why inclusive or extractive policies have helped or hindered progress. The book tends to be rather repetitive, sometimes too repetitive for my taste. Also, sometimes the sentence constructions are a bit awkward. Nevertheless, the book gives some fascinating insights into political science, and why nations become progressive, or tend toward failure. Overall: very very interesting and very important topic. I would give it 5 stars except it is very long, detailed, and not an easy read. However well worth it.Thesis in brief: some countries are properous, and others are not. What causes the difference? Some are right next to each other and the difference in prosperity can not be explained by geography, climate, or even culture. Instead it is the system, and what is it about the system that explains the difference. They elaborate a theory that there are "inclusive" political and economic systems, and there are "extractive" political and economic system. A precondition to either of these is a minimal level of centralized political control.To distill this to a very simplified level: a region needs to develop a minimal amount of centralized control. At that point it is possible to create a system that is inclusive, where power is somewhat distributed, and economic gains are shared, which helps make the economy grow in a sustained way. At some point it is possible to switch to an extractive system where the people in power manipulate the system to enrich themselves and to stay in power, and at that point sustained growth becomes impossible. The rest of the world passes it up, or in some cases the country descends into ruin.The bulk of the book is a scholarly and encyclopedic study of different cultures, testing and demonstrating the theory.Mexico vs. USA: neighboring countries and the difference in climate does not explain the extensive difference in the properity. Surprisingly, 500 years ago Mexico was far more prosperous than the land north of the border. Mexico had 500 times as many people per sq. mile than Virginia, it had an advanced civilization, and tremendous wealth by any measure. How did it come that today USA is so prosperous compared to Mexico? When the Europeans got to mexico, they immediately set up an extractive system to enrich themselves, while in Virginia the Jamestown settlers came close to extinction, and had to set up an inclusive system in order to survive. Once the pattern is set, it is very hard to change, and echos of these patterns survive today.Chapter 2 addresses all of the common folk theories of why rich countries and poor countries are different: geography, culture, & ignorance. Evidence against is presented. The conclusion: "poor countries are poor because those that have power make choices that create poverty"Chapter 3 explains extractive and inclusive using the example of South and North Korea which were identical before the border was drawn at the 38th parallel. "Nations fail when they have extractive economic institutions supported by extractive political institutions that impede and even block economic growth." Economic growth requires that 'creative destruction' that Adam Smith referred to, and in an extractive system, those in power oppose change because they fear it will dilute their power and wealth. They actively oppose change. However, without change you can't have growth. Congo and Soviet Union are given as examples of extractive systems that achieved limited growth because the elite actively directed the resources to this end ... but it does not last.Chapter 4 talks about systems that change from one form to another at a critical juncture. The black death. The Glorious Revolution. Japan in transition from Edo to Meiji. Chapter 5 is a wide ranging survey of countries (and periods of their history) with extractive systems.Chapter 6 covers rise and fall scenarios: Venice, Rome, others.Chapter 7 stands on its own and presents the answer to the question: "Why did the industrial revolution happen in England?" After all, England was not that different from the rest of Europe, but those small differences, and a critical juncture, pushed it in just the right way to be ready for the technological advances of the industrial revolution.Chapter 8 gives many example (e.g. Somalia) of how the people in power of some countries avoided any advantage from the industrial revolution .. and were left economically behind because of it.Chapter 9 gives some example (most notably the Spice Islands) where invaders managed actually to destroy inclusive cultures in order to line their own pockets.Chapter 10 discusses the diffusion of prosperity and how that enabled key countries to benefit from the industrial revolution.Chapter 11 explains the virtuous circle and how when a country manages to get inclusive economic and political institutions, it tends to stay that way in a stable configuration.Chapter 12 explains the vicious circle, the pattern where extractive systems tend to reinforce themselves and become stable, even as the country sinks into ruin.Chapter 13 brings us back to the present day, Zimbabwe, Sierra Leon, Argentina, Korea, and the US south (slave states).Chapter 14: some positive stories of countries that made a narrow escape: Botswana started very poor, but has grown more than any of its neighbors into a country with the highest per-capta income in sub-saharan Africa. How the south escaped slavery, how those institutions persisted for a hundred years, but finally made it out.Chapter 15: with all that groundwork behind you, you are finally prepared to fully understand properity, poverty, and their causes. They reject the idea that natural growth will bring prosperity once the country is educated enough. Foreign aid will never work in a country that has extractive institutions -- what has to happen is a change to inclusive, and there is nothing natural or easy about this change.The book yeilds a lot of insight on the ways that countries can evolve, and indeed patterns that are sure to cause failure. I can't stop wishing that the authors could offer a sure fire way to solve the problem, to turn a country from extractive to inclusive, but alas this is not included in book. It is clear that no simple solutions exist. It would seem that each country to be "saved" would probably need a solution unique to it.In poor countries they found extractive institutions; in rich countries inclusive institutions; however the cause and effect is not completely clear. We don't really know what causes the form encountered, nor what might cause a change of form. Thus is might simply be that a particular country just happens to be poor and extractive -- it is hard to say whether change to an inclusive structure is even possible. Maybe you have to growing to have inclusive systems. What is the chicken, and what is the egg?This does not diminish the book in any way. Their 15 years of research are brought to expose patterns that I expect to enhance my way of viewing world politics, economics, and culture, for many years to come. The central idea of the book is that states fail because of their political institutions, namely because of their extractive nature. This thesis is extremely simplistic.Economic processes are never this one-dimensional. The authors argue that the three theories of poverty (nations are poor because of their unfortunate geographic location, their culture does not facilitate growth and the West simply does not know how to transform poor countries into rich ones) are completely irrelevant which I disagree with. In this sense, the book reads like an essay written by an undergraduate student who has been told to pick a viewpoint and stick to it and back it up no matter what. The assumption that only politics and political institutions determine whether a country is 'poor or prosperous' is too one-sided. The authors also back their ideas up with countless examples from history which sometimes tend to be irrelevant and random. For example:They state that disease is not the reason why Africa is poor, it is rather the consequence of Africa already being poor. Solution: African governments should invest in health care just like England did in the 19th century. The leader of the Industrial Revolution was by no means a poor country. They had the means and resources to do lots of things that Africa can only dream of. Therefore, this solution is not really much of a solution. Assuming that the political elite in some of the poorest nations in Africa have the resources to build up a new system of health care (this would also mean that the government should provide education for the public which in turn would mean that the mostly agricultural nature of the society would have to change because the country would need educated professionals) is not feasible. Of course, some of them might and just choose to keep all of it for themselves but building a country essentially from scratch is not that simple. The authors also argue that growth under extractive institutions is possible. The Caribbean islands were extremely wealthy in the 17th and 18th centuries despite their extractive institutions. They were not poor and definitely not 'failed'. The authors then argue elsewhere that several countries in the Middle East only thrive because of oil, should oil prices fall, they would quickly lose some of their wealth. This is probably true but we cannot ignore the fact that those states are wealthy even though they operate under extractive institutions, just like those of 17-18th century Caribbean. And calling the Ottoman Empire and the Mayans failed is simply incorrect. If a civilization manages to thrive for hundreds and hundreds of years, it is definitely not failed.There is obviously merit in the authors' argument and the whole thing is very convincing. I certainly learned an important skill for the future. History does matter but the book drones on it too much. The authors constantly repeat themselves and it made me feel as if someone was hitting me in the head with a hammer, making sure that I understand that "Nations fail because of extractive institutions." Colonialism and authoritarian governments do indeed stagnate the economy as a whole and create distrust among people. Evil institutions never do too much to help the general public. But they're not the only reason why some countries are poor and some rich. I think the premise of this book is fantastic, and the first 50 pages were terrific. Beyond that, I was pretty disappointed by the execution. The book is built upon the theory that it is not economic policies, but rather "institutions" (such as good governance, social norms and a strong legal system) that play the fundamental role in economic growth and development. I find this to be a compelling theory and I think it is an extremely useful framework from which to view economic and political development. Like most "big theory" books, this book is spent explaining how this theory explains the world. I think the main problem with this approach is that these are economists (and not economic historians) trying to write about history, and their history is awfully simplistic. The economic history of institutions would be fascinating, if done in a comprehensive way, but this reads more like a superficially researched college history paper than a comprehensive history of institutions and their role in economic history. Judging from Acemoglu and Robinson's version of history, institutions explain all major political developments of the past 5 millennia, and there are no counter-examples that contradict their explanations. These are unrealistic positions. The hypothesis is clear very early on; what follows is an evidence-loaded journey that keeps hammering the intriguing and simple message home: that extractive, exclusive institutions wreck a country while profiting the elite who holds the power to change the institutions ; and inclusive institutions provide a country with economical growth, while on the long run providing mechanisms through which inclusive institutions are kept.As many other reviewers have noted, they are however simplistic in providing and debunking counter-evidence. They unfortunately never ask the question that's begged in this book: "Are there structural explanations for the rise of extractive institutions"?All in all, an important book that tries to explain the rampant poverty still around in the world. If you want to read more about the constitution of poverty, I'd suggest reading it along books like Jared Diamond's "Guns, Germs and Steel". The bonus for this book, however, is that it is something policy wonks like me can grasp and can make us believe there's a way to get rid of poverty. A ragged and somewhat bloated masterpiece.The core theme here is not new: sustained prosperity arises where there is pluralistic government under the rule of law. To the extent a society approaches this structure, which the authors call "inclusive," it develops inclusive--ie, open-- economic institutions, where no elite can obstruct progress. This is contrasted with "extractive" economies, stultified by political elites who repress the "creative destruction" that drives growth but threatens their power.The authors mostly avoid such terms as "democracy," "free markets," and "capitalism" because their chronicle covers thousands of years and those are modern concepts. But at bottom, those are the ideals the authors are aiming at.So this is the latest in a long line of works by the likes of Adam Smith, John Stuart Mill, Ludwig Von Mises, Frederick Hayek, Milton Friedman, Mancur Olsen, and Francis Fukuyama. Does it add anything? Yes it does, quite a lot.The contribution here is to chronicle the historical correlation between "inclusiveness" and prosperity; and conversely between "extraction" and decline. It is a feast of historical anecdotes proving the correlation.For example, those who argue that riches or poverty are determined by culture, or religion, or natural resource endowment, or geography, need only look at two borders: those between Nogales, Arizona and Nogales, Senora; and North Korea and South Korea. It is politics, not any of those other things, that is decisive.The authors' theory is deterministic in the sense that ONCE inclusive political and economic institutions are in place, progress is assured; and conversely, as long as a society remains extractive, decline is assured.But on the question of HOW societies BECOME inclusive, the theory is not deterministic at all. On the contrary, such developments are episodic and contingent, the result of "critical junctures" such as the Black Death (which shifted power from the landlords to the laborers) or the opening of Atlantic trade routes (which undercut chartered monopolies) or the Glorious Revolution of 1688 (which cemented the supremacy of Parliament and the rule of law); or specific personalities (such as the enlightened tribal chiefs of Botswana at independence in 1966 or Deng Xiaoping in Red China in the late 70s); and luck.How do they fit their theory to Communist China, a politically extractive but economically partially-inclusive society that is experiencing dramatic growth? It won't last, they say, unless there is vast political change.China has prospered because "there was a lot of catching up to do." It could exploit existing technology and foreign investment by loosening the economy just enough. But there is no creative destruction in China. The Party still holds its fist over every important enterprise, and every entrepreneur still needs party permission and support to succeed. And the surest way to become rich is to be a high party official. This makes the authoritarian system a spoils game, and will incite upheaval and instability as factions contend for power. We'll see, but I'm convinced.My only criticism is that the writing style is more pedestrian than inspired. It needs a sharp-penciled editor. But other Great Works are much more obscurely written--Marx's "Capital" and Keynes's "General Theory" are lead examples. This is a model of clarity by comparison.Anyone who writes a book that Explains Everything sets himself up like an elk in a wolfpack. A lot of people will be threatened by this book and they will nibble and nitpick at it in the way creationists attack evolution. The rejoinder is straightforward: if you disagree, produce your own historical chronicle impeaching this one. We will wait a long time. A fascinating (albeit difficult to grasp) study on why some nations succeed whilst others fail. The amount of information in this book is astounding, seeing as it is the result of 15 years of research on the topic. This is definitely a book I will re-read, because with a first read you just get the basic argument, but with the second one you get all the subtleties. I recommend this to anyone with an interest in why our world is the way it is. Daron Acemoglu and James Robinson's Why Nations Fail examines the impact our human-created institutions have on our economies and creation of a "good life" for the many. They do this with a lot of detail. Many of their observations both apparent and useful. Despite this, the book has a number of flaws that seem, to this reviewer at least, critical. Let's start with the good: the author's central thesis seems sound. Governments and the institutions they create do matter. For instance, consider North and South Korea. Both have similar histories (until 1950, that is). Face the same environmental conditions, and arise from the same core Korean culture. And yet the countries are quite opposite.In the north, a military regime strips wealth from the regular people, and places it in the hands of a few. The state does not incentivize people for trying new things. Instead, the state is organized militarily, the state's sole aim in perpetuating the lives of its ruling class -- specifically the bloodline of the "emperor" Kim Jong-un. The authors call this an Extractive State. These leaders create institutions that extract wealth, and focus it in the hands of the few. In South Korea, things are different. Less militarily oriented, their government has created institutions that helps economic development thrive: a sound currency, a legal system to enforce contracts, and a tax and property structure that rewards individual initiative. The authors call states like this Inclusive States. They create an ever-increasing standard of living for all, and not just the oligarchs. The results produced by the two Koreas are, of course, 180 degrees apart. South Korea is thriving, First-World industrial economy. The North impoverished, stifled by military dictatorship.So far, so good. It is a great premise that is beyond reproach. Though often a bit of a pain, there is no doubt that a strong central authority is needed to keep a state intact. And after reading Steven Pinker's The Better Angels of our Nature, I am pretty well convinced that humans in strong states -- even a bad one -- are better off than those in a weak state. Pinker shows, using a remarkably diverse selection of historical data, that fewer people die of war or murder in a centralized state. And that, while we need to watch our leaders lest they lead us astray, Rousseau's "Noble Savage" is a literary construct that does not hold up to closer inspection. And Acemoglu and Robinson's main argument bears this out. The authors take a step forward, and do an excellent job delineating that some of those centralized states are better that others. And they wonder why -- which is again the proper move. My problem with their answer is that it tends to over-emphasize Free-Market dogmatism are the "real reason" these countries thrive. And this is often not the case.Let us consider the USA. To begin with, the United States was initially a slave nation, with the southern half of the nation shipping raw cotton to British ports -- making the US an extactive state by the author's definitions. And yet we have risen above this. How? Were you to ask how, Acemoglu and Robinson's answer would likely be "by creating institutions that encouraged Creative Destruction of the inefficient industries and encouraging Free Market Capitalism. "This is, of course, a fairy tale told to children by Free Market cheerleaders. US did not rise to dominance by applying Free Market principles. Instead, through the 19th and into the 20th Century, the US had very high tariffs to protect its fledgling industries. Acemoglu and Robinson ignore this. Or perhaps their belief in their core argument blinded them to the fact. Whatever the reason, the miss is huge. The authors also gloss over other exceptions to Free Market dogmatism. For instance, South Korea has a very Confucian-style command economy. It created its contemporary industries -- steel, auto, etc. -- by imposing huge tariffs and supplying capital infusions to firms in key industries. Once they were established. the government kicked out the financial supports, and lowered the tariffs -- albeit gradually. But the point is that it was not a Free Market that South Korea pursued. It was very Command-and-Control. And yet South Korea succeeded. Japan is another example of a tightly integrated public/ private economy. A very tight group of elites created and maintain an excellent, stable society that benefits everyone, and not just the few. This is ignored. Worse is the lack of respect offered China. Despite its defeats in the late 19th and early 20th Centuries, China has a long history of wealth creation, stability and high standards of living. They have more experience than the West does in feeding billions utilizing a strongly centralized state. While there is little doubt that Mao's "Great Leap Forward" was a disaster, Chinese history stretches back to the Xia Dynasty in 2070 BC -- or over 4,000 years. To focus on Mao's biggest error seems weak. It ignores the Chinese people's historical ability to create stabilizing bureaucracies to administer its large and complex culture.Even worse for the authors' thesis: China's administrative apparatus included many state-granted monopolies -- in salt, for instance. And yet, until the 1700's, China was the wealthiest nation on the earth. Acemoglu and Robinson ignore this. As they do with many facts that contradict their Free Market "solution." And the facts they ignore are not "tiny" factoids, but gaping mounds of readily available historical data. Instead, they present only facts that square with their Anglo-American, Free-Market worldview. The work has other weaknesses as well. My biggest criticism is the refusal to see that there are some real ecological and geographical constraints on growth. All one need do is drive west in the United States to notice this. Where resource-light 17th-century style shipping was easy -- the Atlantic coast, Great Lakes and Mississippi basin -- development is high. People live in closely grouped clusters. You see this development replicated along the Pacific coast. But consider the emptiness in between -- most of Colorado, Utah, Arizona, the Dakotas, Wyoming, Montana, New Mexico, western Kansas, western Nebraska, and Nevada. The populations centers there would be unthinkable without modern transportation. And even then, the sparse development bespeaks an inability of the region -- due to the area's inherent dryness -- to sustain populations. And these cities exist for a single reason: mineral mining.These ecological tendencies limits grow more pronounced as you move into the tropics, however -- especially aboriginals in isolated jungle areas. For instance, consider a rain forest pygmy living in Central Africa. The rivers are unnavigable rivers, the forest and undergrowth thick and tough too journey through. They are cut off, thousands of miles from the ocean. This limits the connections a person is subject to. And not only in trade, but it limits the tribe's access to information. How could you compare this part of Africa to an island like Japan or the coast-rich USA? Again, this is ignored.Worse is how the authors dismiss well-regarded views that are at odds with their Extactive/ Inclusive, Oligarchy/ Free-Market ideas. For instance, Acemoglu and Robinson try to dismiss Jared Diamond's wonderful look at the impact of biology and geography on history, Guns, Germs and Steel, ignoring what the book actually says. Diamond presents a birds-eye view of what factors led to advanced culture arising in the West 10,000 years ago. Diamond is tracing long-long-long-term trends. His is a work of anthropology and ancient history. Acemoglu and Robinson ignore this, and write it off as unfounded. How? They point to the US/ Mexico border and North/ South Korea. Ignoring that Diamond is referring to events that occurred before written history. So while I agree with Acemoglu and Robinson's basic premise -- government and institutions can make a difference -- they try too hard to make this observation fit into the Anglo/ American model. I wanted so bad to rate this book higher. It addresses an important topic: "How do we make societies that work for everyone?" And I was impressed with the level of detail they employed. But the problem I have is their conclusions. Sure, institutions matter. But I doubt that Free Market capitalism is the only way to get there. Witness the tight public/private integration in Japan. Or Germany (where all stakeholders -- shareholders, workers, local governments, environmental groups, etc.) are given a seat at the table. And there is the example of a resurgent China. Will it continue prospering? Who knows? I suspect they will based on their storied history.Because of these weaknesses, I cannot give the book over three-stars. The book's topic is meaningful. And this is a necessary first salvo in addressing these questions seriously.I recommend it to all policy wonks and social science fans. By Pierre BriançonThe book begins in Nogales, a city divided by a fence along the border of Arizona and Mexico, and ends 450 pages later in China, with the story of a young entrepreneur arrested in 2004 for having started a large steel plant competing with the state-owned companies. In between “Why Nations Fail” is a highly readable narrative of a breathtaking trip: from the Neolithic Revolution to 16th century England, from Spain’s Philip II to Stalin, from the Mayan city-states to the Portuguese colonisation of the Moluccan archipelago.Daron Acemoglu, a professor of economics at MIT, and James Robinson, who teaches government at Harvard University, have looked far and wide for an explanation to account for the vast differences in income and wealth between rich and poor countries. They think they have found one. It’s the politics, stupid - or rather, the institutions.The impressively deep and broad research leads to the conclusion that countries, communities and civilisations ruled by what the authors call “inclusive” institutions end up prosperous. Inclusive institutions are pluralistic and support strong and rigorously enforced property rights. They provide the confidence needed to encourage the many to invest in the future. “Extractive” systems, on the other hand, are ruled by the few, who hijack the resources and wealth. Without good politics, there can be no good economy. Democracy is not a nice addendum to wealth: it is a pre-condition.The ambitious quest for a unifying cause is the book’s greatest strength. Acemoglu and Robinson never make their simple truth a simplistic one. Nuances abound, as well as answers to the objections that their case might raise. Nor do they shy away from exploring the impact of other factors - major disease, weather, agricultural potential or natural resources. And they are fair when explaining why they think that rival all-encompassing theories - of geography, culture or other factors - “don’t work”.The single-mindedness is also a weakness. Reality sometimes has to be stuffed into conceptual boxes. The repeated opposition of inclusive and extractive is irritating, if only because the former suggests an excessively rosy, let’s-love-each-other vision of the world. More substantially, the polarity doesn’t leave much room for the cases where the reality is not so black and white.Nor do these categories allow the authors to escape the chicken-and-egg conundrum: as they amply demonstrate, good institutions certainly foster prosperity, but why are the institutions good in the first place? The cultural and economic preconditions - and the role of chance - warrant some deeper analysis.The case for inclusive institutions is appealing, but a closer examination of the cases that may not fit would have helped. The 20th century, after all, gave us some examples of not-that-inclusive regimes that managed somewhat prosperous countries. Singapore comes to mind, but is barely mentioned. Similarly, it would have been interesting to have some analysis of why countries with roughly similar “inclusive” institutions end up with different levels of wealth; it’s simply not enough to discard as “extractive” the traits that don’t fit with the theory.The authors owe much to the works of economic historians, who are duly credited, although the pioneering work of Fernand Braudel on the history of capitalism is bizarrely not mentioned. But as it is, Acemoglu and Robinson have written a book that will remain for quite some time the most provocative attempt at explaining, not only why nations fail, but why people count. - Vài ghi chú nhỏ:Tư tưởng chủ đạo của tác giả đã quá rõ ràng, ngay từ đầu và xuyên suốt các chương sách: Các quốc gia có nền chính trị đa nguyên và thể chế dung hợp sẽ thịnh vượng, giàu có và phát triển hơn những quốc gia nó nền chính trị chuyên chế, hoặc nền chính trị phi tập trung hóa quyền lực (như một số quốc gia ở Châu Phi), vì nó tạo điều kiện cho kinh tế thương mại phát triển, và cơ hội trở nên giàu có cho các cá nhân, thay vì cướp đoạt tài sản và sự thịnh vượng vào tay những nhóm lợi ích hoặc những thế lực chính trị đương quyền.Tuy nhiên, có lẽ sự giải thích này vẫn chưa đem đến sự thõa mãn cho người đọc, vì có lẽ những lý lẽ tác giả đưa ra đều quay về phục vụ cho tư tưởng chủ đạo, mà ko mở rộng nghiên cứu những lý do khác. Thiết nghĩ, việc một quốc gia, một châu lục, ở tầm vĩ mô, không trở nên thịnh vượng có rất nhièu lý do và yếu tố để giải thích, và tùy đặc thù kinh tế văn hóa từng quốc gia mà sự thất bại cũng khác nhau (lưu ý tác giả là người chống đối thuyết văn hóa, vô minh và địa lý trong việc giải thích sự thất bại của các quốc gia).Ví dụ, việc tác giả cho rằng Vương Triều Castile ở Tây Ban Nha, dù tại thời điểm trị vì rất phồn vinh về kinh tế, nhưng về lâu dài trở nên tàn lụi và không phát triển tốt như ở Anh, nơi có nền kinh tế đa nguyên, mở rộng tự do thương mại cho nhiều người, là do thể chế chuyên chế thu vén quyền lực và lợi ích cá nhân của vương triều. Về mặt nào đó lý giải này là xác đáng. Tuy nhiên, trong quyển "Đồng tiền lên ngôi", Naill Ferguson có cách lý giải khác: việc vương triều Castile trở nên suy yếu và kinh tế là do khi phát hiện ra Châu Mỹ, thay vì khai thác Châu Mỹ theo cách thức hợp lý, họ đã cho khai thác vàng bạc ồ ạt một cách vô tội vạ, và làm nền kinh tế suy sụp khi chi tiêu vàng bạc trên vương quốc vượt quá khả năng sức mua và sức sản xuất thời bấy giờ. Nói tóm lại, là sự thiếu hiểu biết về kinh tế và lạm phát đã đưa đến sự sụp đổ nền kinh tế của vương triều.Hoặc trong "Hiểu nghèo thoát nghèo", khi nghiên cứu về sự kém thịnh vượng của người dan ở Châu Phi, tác giả quyển sách cũng đưa ra những nghiên cứu khá xác đáng, về việc bất chấp những thể chế tạo điều kiện cho người dân làm ăn kinh tế và thoát khỏi nợ nần, những chính sách và định chế này không phải bao giờ cũng phát huy hiệu quả tối đa. Cuốn sách đưa ra khá nhiều những nguyên do khác, và cách thức thực hiện, tuy nhiên vẫn chưa có giải pháp nào (kể cả thay đổi thể chế đa nguyên), trở nên hiệu quả tuyệt đối với tình hình người dân ở Châu Phi hiện tại.Tuy nhiên, cuốn sách này có những dẫn giải lịch sử, kinh tế rất thú vị, dù cho những lý lẽ đưa ra để quy về biện hộ cho tư tưởng chính bị lặp lại khá nhiều, gây nhàm chán đôi chút, và cảm tưởng tác giả đang "đơn giản hóa" vấn đề. Mặc dù vậy, mình không thể không bày tỏ sự đồng tình với tác giả về tư tưởng chủ đạo này là yếu tố cốt lõi để xây dựng sự thịnh vượng về kinh tế và sự vững chắc về chính trị mà những quốc gia như TQ, VN, hay một số nước Đông Nam Á nên học tập.Một điều đáng tiếc nhỏ, là tác giả không phân tích cụ thể tình thế chính trị của Singapore, một quốc gia có thể chế rất ít sự đa nguyên, nhưng cũng rất ít sự chiếm đoạt, và đã xây dựng được sự thịnh vượng kinh tế và nền chính trị bền vững đến ngày hôm nay. Nói một cách khác, sự thịnh vượng và thành công của Singapore là một ví dụ rất khác với quan điểm chủ đạo của tác giả, vì nó thể hiện tầm nhìn và trình độ của lãnh đạo quốc gia, hơn là do thể chế mang lại. I could have given this book 4-stars, but I felt 3 were more appropriate in the end. I really think this book's title is a misnomer: it should be "How Nations Fail." I agree the extractive/inclusive dichotomy of political institutions is a useful and explanatory model of a country's economic success and failure. I think it explains much of how a nation/political organization fails. I also like how they point out that failure can take time, and things may look good for a time before they start going downhill. I cannot, however, agree that only the extractive/inclusive dichotomy (along with creative destruction/innovation) are the only explanation for failure. The dismissive attitude towards geographic, disease, and technological factors is astounding. We may see these extractive/inclusive institutions as the medium through which nations can fail and can succeed, but I did not feel they adequately addressed how such institutions come about in the first place. Would the Spaniards and other European powers have been able to put in place the extractive institutions without most of the indigenous population of the Americas being destroyed by disease? I highly doubt it. The few thousand Spanish that conquered Latin America could hardly have done that without the advantage of disease and immunity. I also felt that many of the examples they gave were anecdotal (which I suppose is the nature of these types of books) and perhaps even extreme situations that exemplified their theory. They completely ignore the threat of Mongol invasions of Eastern Europe in the 13th century, the influence of the crusades, the occurrence of the Renaissance, and hardly mention the Scientific Revolution/Enlightenment. Could inclusive institutions have been created without such events? It seems they would lay the occurrence of all those events at the feet of inclusivity. I would argue that the Glorious Revolution could not have occurred without the scientific and philosophical progress that was occurring and accumulating at the time. Overall, it is a book that is worth reading to those interested in these grand, sweeping books of theory that attempt to explain civilization (like Guns, Germs, & Steel), though the style of jumping from example to example is a little jarring. It was not as enjoyable as some of the other books like it because of that style. On one page you are reading about one country and on the next another country centuries later. They do provide many interesting examples, so if you are also into history this book would appeal to you. If you are a person that likes the evidence presented rather than a narrative this book will likely annoy you (as it did me). I know they are trying to appeal to a wide audience, but there was nary a chart or graph in this book. A few maps, a set of images and that was it. The narrative text did not even provide much in the way of empirical evidence to back up their claims. The authors essentially ask you to believe and go along with the story they are weaving. I found this book very interesting. I found the book very satisfying in ways that "Guns, Germs and Steel" was not; countries are not poor because of initial resource conditions or ignorance on how to become more prosperous. More often, those in power create political and economic structures to secure power while sacrificing the long-term welfare of the rest of the nation, crippling a country's ability to adapt to changing conditions or use labor and resources efficiently. The book stresses the importance of political power in a more meaningful way than many books that I've read. The author describes his thesis for why nations fail through the basic premise of inclusive economic and political institutions combined with opportunity at "critical junctions". The author reviews several regions (North vs. South Korea, the Roman Empire, Venice, the Ottoman Empire, Ethiopia, Argentina, Eastern Europe, the UK, the US) and how their political and economic institutions enabled these countries to respond to changing political times. I worked for an international affairs journal when this book was first released. I remember the considerable energy the authors seemed to be putting into its marketing – the articles, the interviews, the debates, the blog, the proliferation of review copies. It seemed like there was a concerted effort to get Why Nations Fail added to that canon of suspect, generalist readings of geopolitics – your Clash of Civilizations, your Tragedy of Great Power Politics, your End of History and the Last Man – that worm their way into the lexicons of all first-year IR students alongside the terms “realism,” “constructivism,” and “neoliberal institutionalism.” I must confess that at the time I was put off by the baby blue cover (everyone knows that all serious works of poli-sci keep their color schemes to the austere blacks and whites). But it was about time to give it a go. The book’s central thesis is very simple. “Extractive institutions” limit “creative destruction” (borrowing Joseph Schumpeter’s famous term) as a society run by a “narrow elite” with entrenched power fear a disruption of the status quo. This “iron law of oligarchy” limits long-term market success. The answer lies in “inclusive” economic and political structures that foster a “virtuous circle” of innovation and sustainable growth. These phrases are repeated ad nauseam. They season the cherry-picked case studies that span the vast breadth of human history and take up the meat of the read. If all that seems rather obvious, I don’t think you’re alone. Who among those with access to this text remain unconvinced that graft, monopolism, despotism yield limited prosperity for society at large? Vladimir Putin? Viktor Orban? Donald Trump? I’m sure their motivations stem from very different sources of inspiration than those the authors have in mind. As for the Western academic tradition – it seems rather conclusive on this matter. Why Nations Fail doesn’t deal much in nuance. It commits to a definition for neither “nationhood” (surely something a bit different than Benedict Anderson’s imagined communities) nor “failure” (are we talking a runaway Gini coefficient – large-scale income inequality? Scarcity? Barbarians at the gates?). So, what are we left with? Almost a tautology. Nations are sets of state-run institutions. They fail when those state-run institutions break down. Naturally. I’m going to coin a term here. As a disclaimer: I’ve never studied classics so it’s probably less-than apt, but here goes. Historrhea (from Ancient Greek ἱστορία historía “history” and ῥέω rheo “to flow”) | noun | hist˙or˙rhea. Historrhea is characterized by excessive and sometimes incoherent tellings of societal events. I find there’s a lot of historrhea in these sorts of books that attempt to prescribe some grand narrative to human civilization. That seems to be what’s going on here and I’m not a huge fan for a few reasons: (1) It comes across as tendentious. I’ve witnessed enough anthropology professors dealing body blows to Guns, Germs, and Steel, the misguided goodwill of Jeffrey Sachs, and the latest Tom Friedman mixed-metaphor to know that things are rarely that simple. A lot of people have lived on planet earth. And collectively they have done a lot of stuff. You can bend the past to fit a linear argument in pretty much any way you want if you try hard enough. That doesn’t mean you’ve stumbled upon some harmonious truth to the universe, especially if… (2) There is almost no reliance on data/statistical modeling. This was a huge disappointment. I understand that Why Nations Fail was written as a work of pop-history, but Drs. Acemoglu and Robinson are respected economists. Why not play to your strengths and craft a more compelling, rigorous argument in the process? As it stands… (3) The results are not very educational. I read non-fiction to learn. It is very difficult to internalize information – for me at least – when the text skips haphazardly throughout time and space, dealing in surface-level treatments of complex issues like a disorganized AP World History study guide. The analysis of events never makes it past the Wikipedia page. I know enough to be suspicious of this.Drs. Acemoglu and Robinson reject the “historical determinism” of other hypotheses for state success and state failure, but to me that’s kind of like a proponent of the Cartesian theater rejecting neurological determinism. Sure, you’ve liberated the mind from its fated ends, but how, then, do you do the same for the homunculus you’ve created? Here too, we manage a claim that nations may determine their own fate through the institutions they establish, but where do these institutions come from? Wherein lies the will to will? Really you’re not getting anywhere at all. The theories proffered by Why Nations Fail are purely descriptive in nature. Drs. Acemoglu and Robinson acknowledge this lack of predictive power, but I’m not sure that makes it better. I think the most damning indictment of this sort of work comes at the authors’ own hands. As the book concludes, Drs. Acemoglu and Robinson can’t resist making some tame prognostications based on their thesis. The year is 2012. China is bound for a crash, they write; its authoritarian regime can’t hold on. Conversely, Brazil’s future is looking bright as the party of Lula rights the ship. In 2017 we know a bit of how things play out. Xi Jinping consolidates power as the Chinese economy continues its implacable advance. The reports of its demise have been greatly exaggerated. Meanwhile, Brazil remains mired in its worst recession on record while the government is wracked with corruption scandal after corruption scandal. Of course, there is always time for things to turn around. Even those in the Chinese politburo – riding high – must know this. The empire, long divided, must unite; long united, must divide. Thus it has ever been. Perhaps a window will open up in which the authors can claim vindication – that they were right in the long run. Of course, another famous quotation comes to mind in response.Two stars. In the long run we are all dead. Бестселлер "Почему одни страны богатые, а другие бедные. Происхождение власти, процветания и нищеты" очень качественная и невероятно важная книга, которая помогает осознать истоки таких важных вопросов в истории человечества, как, например, почему, какие факторы, какие причины, как объяснить, к какому выводу прийти и в чем же корень таких проблем как бедность множества стран и регионов в нашем современном, казалось бы, мире?...Авторы не слишком спешили с согласится с другими не менее важными научными трудами в данном сложном вопросе. Они отнеслись весьма критически к предыдущим научным исследованиям своих предшественников в вопросах экономической политики. И, должен согласится, не зря они это сделали.Книга получилась очень насыщенна фактами, историческими данными, примерами и аргументами ученых. Хотя слегка показалось, что слишком уж большой крен положили в сторону виновности во всем одних лишь политиков. В большинстве я почти во всем согласен, но этот «крен» считаю все-таки лишним.Что касается соответствию названию книги, то авторы полностью с ним справились. Но после прочтения книги осознаешь, что хотелось бы не только осознать в чем же таки проблема, а как же ее исправить и не допустить в будущем, и как создать такие условия на Земле, когда регрессия и откаты к старым политическим моделям уже никогда в жизни человечества не случится?... но это уже должна быть совсем друга я книга. دارون عجم اوغلو و رابینسون در این کتاب بر نکته بسیار مهمی تأکید میکنند: ساختارها و نهادهایی که دموکراسی را پدید می آورند. ساختارهایی که قادرند «بدنه» دولت را در عین حفظ «تمرکز قدرت» آن کاهش دهند و نقش نهادهای مردم نهاد و غیردولتی و غیر حکومتی را پررنگ تر کنند. نمونه های عینی بسیاری از بررسی تأثیر شرایط جغرافیایی (بوتسوانا و زیمبابوه) ، فرهنگ (کره شمالی و جنوبی)، سیستم های حاکم و ... آورده می شود تا نشان داده شود تنها عامل تعیین کننده در «پایداری» و «توسعه پایدار» سیاسی و اجتماعی و فرهنگی، «نهاد» ها هستند. کتاب تاریخچه بسیار مهمی از انگلستان قبل از انقلاب صنعتی را آشکار می کند و نشان میدهد که چگونه و چرا یک تغییر کوچک در سیستم حاکمیت ارباب-رعیتی قرن چهاردهمی به سمت افزایش قدرت نهادهای غیر حاکم سه قرن بعد توانست انقلاب صنعتی، و پیشرفت های خیره کننده ای را برای انگلستان به ارمغان آورد که قرن های بعدی به عنوان حاکم بلامنازع جهان نقش آفرینی کند. کتاب هم چنین به دقیق ترین و جامع ترین شکل ممکن نشان میدهد که چرا «بهار عربی» با وجود محتوا و فرم بسیار روشنگرانه و آگاهانه اش، هنوز هیچ دستاورد مهمی در ایجاد دموکراسی ساختاری نداشته است. خواندن این کتاب را به همه دوستان، بعد از خواندن کتاب «عقلانیت و توسعه یافتگی ایران» دکتر سریع القلم پیشنهاد میکنم. Why is it that there are such huge differences is living standards around the world? 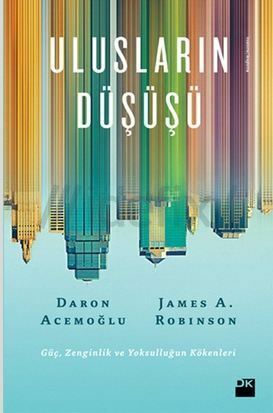 Why is it, that certain nations have become rich and will become ever more richer, while other countries time and time again, fail to improve their living standards?In this book, Daron Acemoğlu proposes a refreshingly simple theory that explains the main contours of economic and political development around the world sine the Neolithic Revolution. The theory discards some existing (and widely accepted) theories such as:•	The geographic hypothesis: this theory claims that the great divide between rich and poor countries is created by geographical differences. Many poor countries tend to be in the hot zones of the earth, such as Africa, Central America and South Asia, while the more prosperous countries are located in the temperate zones of Europe and North America. However, this theory is contradicted by countries such as Singapore, Malaysia, Australia and Botswana•	The culture hypothesis: this theory relates prosperity to culture. The theory points out that cultures, religions and other ethics directly influence economic activities. Although this theory may be regarded by much people as valid, it does not explain the differences between North and South Korea.•	The ignorance hypothesis: this theory asserts that inequality exists because the rulers of a lot of poor countries simply do not know how to make their poor countries rich. The theory states that poor countries have a lot of market failures and their economists and policy makers do not know how to get rid of them and have heeded the wrong advice in the past. The problem is that if ignorance was the problem, well-meaning leaders would quickly learn what types of policies increased their citizens’ incomes and welfare, and would gravitate towards those policies. So why has this not yet happened and why do countries do not seem to learn from their mistakes?So what is the theory that Daron Acemoğlu offers in this book? The theory makes a distinction between inclusive and exclusive economic and political institution.Inclusive economic institutions provide the rules how the economy works and the incentives that motivate people to make the best use of their talents and skills and that enable individuals to make the (economic) choices that they wish. To be inclusive, economic institutions must feature secure private property, an unbiased system of law, the entry of new businesses and allowing people to choose their careers. Exclusive economic institutions provide none of the above: instead they lack secure private property rights, which allows extractive economic institutions to extract incomes and wealth from one part of the population to benefit another part of the population. Therefore, a businessman in an extractive economic institution, can expect his output to be stolen, expropriated or entirely taxed away will have little incentive to work, let alone any incentive to undertake investments and innovations.All economic institutions are created by society. Political institutions determine who has power in society and to what ends that power can be used. If the distribution of power is narrow and unconstrained, the political institutions are extractive, allowing those who wield the power to set up extractive economic institutions to enrich themselves and augment their power at the expense of society. Inclusive political institutions that are sufficiently centralized in order to provide a role as enforcer of law and order and encourage and regulate economic activity, are called inclusive political institutions.There is a strong synergy between economic and political institutions. Extractive political institutions concentrate the power in the hands of a narrow elite and place few constraints on the exercise of this power. Economic institutions are then often structured by this elite to extract resources from the rest of the society. Extractive economic institutions thus naturally accompany extractive political institutions. In fact, they must inherently depend on extractive political institutions for their survival. Inclusive political institutions, vesting power broadly, would tend to uproot economic institutions that expropriate resources of the many, erect entry barriers, and suppress the functioning of a market that only a few will benefit.This synergetic relationship between extractive economic and political institutions enable the elites controlling political power to choose economic institutions with few constraints or opposing forces. Extractive institutions in turn, enrich the same elites and their economic wealth and power help consolidate their political dominance. When existing elites are challenged or replaced by newcomers, the newcomers are likewise subject to only a few constraints and have incentives to maintain these political institutions and create a similar set of economic institutions.Inclusive economic institutions, in turn, are forged on foundations laid by inclusive political institutions, which make power broadly distributed in society and constrain its arbitrary exercise. Such political institutions also make it harder for others to usurp power and undermine the foundations of inclusive institutions. Those controlling political power therefore cannot easily use it to set up extractive economic institutions for their own benefit. Inclusive economic institutions, in turn, create a more equitable distribution of resources, facilitating the persistence of inclusive political institutions.So why are there so many exclusive economic and political institutions in today’s world, and so few countries with inclusive economic and political institutions? Why didn’t these exclusive countries switch to inclusive institutions, allowing them to become even more richer? The theory introduces the term of creative destruction, which explains why extractive institutions exist even today. Powerful groups often stand against economic progress because they fear the transformative and destabilizing process that is associated with economic growth (called creative destruction) and that their economic and political privileges will be eroded.It is therefore that we see through history until today’s world, that poverty still exists in our modern world. The poor stay poor due to their exclusive institutions, and the rich countries (who turned to inclusive institutions somewhere in the past) stay rich or will become richer. The book is written for a general audience, and if you're feeling smart and ambitious, it is well worth reading. It aims to be the "Guns, Germs, and Steel" of the social sciences. The thesis in "Guns, Germs, and Steel" is that Geography/Climate is Destiny. Civilization arose and thrived where geography and climate endowed people with the most nutritious and easily cultivatable food. Those locations created dynamic human societies that gave rise to complex socio-political institutions, sophisticated languages, inventions, and so forth. "Why Nations Fail" addresses not the rise of civilization but rather the success and failure of modern nation-states. Why, for example, has the United States succeeded so much better than Mexico? The answer: Institutions are Destiny. Where inclusive, democratic-style political institutions are put in place early on, they produce economic progress and all good things, like rapid technological advances. American colonists got it right; Spanish colonists did not. All else flows from this. (Though, if forced to pick a single moment on which the fulcrum of history swings, "Why Nations Fail" would choose the 1688 Glorious Revolution in England rather than the founding of America. )Most people I know already believe that the founding of the United States and its associated institutions (Declaration of Independence and the Constitution) are in fact responsible for the great things that have happened in this country. But this book only occasionally looks at the United States. It gazes more frequently at examples of poor political institutions, probably because there are many more examples to choose from. In recounting all the political institutions you've never heard of (from long-gone African kingdoms to colonial patterns in Central America), the book takes readers on a fascinating journey.The book excels at drawing connections between those institutions and good economic outcomes, like growth and innovation. I've always believed that institutions are destiny. This book illustrates the ways in which institutions shape social and economic activity by using broad patterns and, at times, careful historical process-tracing. The case of the Southern United States is a fascinating example. The South failed to get its institutions right after the Civil War and thus descended into another 100-plus years of less robust growth and economic progress than the rest of the United States.What does the book not do? It does not explain how these institutions arise, though at times it wants to. It also does not give enough credit to the importance of values and ideas. It might also underplay the importance of human capital (i.e., education). Wordiness is a problem; many chapters repeat main points far too frequently. But, all in all, a fabulous book and amazing achievement. This book explores why some nations fail and others do not. The authors lay out their thesis early on (Pages 3-4): "Countries such as Great Britain and the United States became rich because their citizens overthrew the elites who controlled power and created a society where political rights were much more broadly distributed, where the government was accountable and responsive to citizens, and where the great mass of people could take advantage of economic opportunities. "In the process of addressing their thesis, the authors also look critically at some competing theories--geography, culture, ignorance. One comparison that serves the authors well is the fates of North Korea and South Korea, and why their well-being has diverged so widely.The authors provide a wide ranging analysis, including a critique of managed economies and a question about the staying power of high fliers such as China.One question that occurs to me, though, is how certain examples of increasing economic differences and, in the United States, Court decisions that enhance the power of economic powers might play out. Are there potential problems facing some of the democracies with increasing inequality? Only time will tell, but it is a question that arises when looking at the data.All in all, an interesting and important work. The central thesis of this book is that nation fail economically because of their political institutions. The non-democratic (extractive is used in the book) political institution with power concentrated on one person or group of elite, will produce economic institutions that only beneficial to the ruler on the expense of the public. While the more pluralistic and democratic political model will maneuver the economy to the interest of the public. This thesis although highly attractive and simple seems like it is over simplified. Although plausible, the generalization is quite hard to swallow. China has been discussed in detail, but there are many authoritarian states that still manage to build strong economic development such as Saudi, Qatar, and others oil rich countries.All and all, this book is very pleasant to read, provide food for thought. Even if it didn't solve the world poverty problem, it create an underlying hypothesis for the solution that can be thought, re-thought and finally been tried. A goodread indeed! The lack of arguments and statements like: "Unlike in Mexico, in the United States the citizens could keep politicians in check and get rid of ones who would use their offices to enrich themselves or create monopolies for their cronies." (In 19th century? Really?) or "“Just as the United States in the nineteenth century was more democratic politically than almost any other nation in the world at the time, it was also more democratic than others when it came to innovation.” do not make any sense. I am not going to finish this book. Daron Acemoğlu James A. Robinson Faruk Rasim Velioğlu - Daron Acemoglu is the Elizabeth and James Killian Professor of Economics at the Massachusetts Institute of Technology. In 2005 he won the prestigious John Bates Clark medal, awarded to the best economist under 40.